There’s probably been a time when we’ve all wished we could win a jackpot! Well now, thanks to Blueprint Gaming, we can put those wishes to the test by playing the Wish Upon a Jackpot slot. If you’re lucky, your very own fairy godmother might appear, cast her wand to produce some magical orbs, and give you some fabulous winning opportunities. Interested? Read on to discover the many benefits of playing Wish Upon a Jackpot! 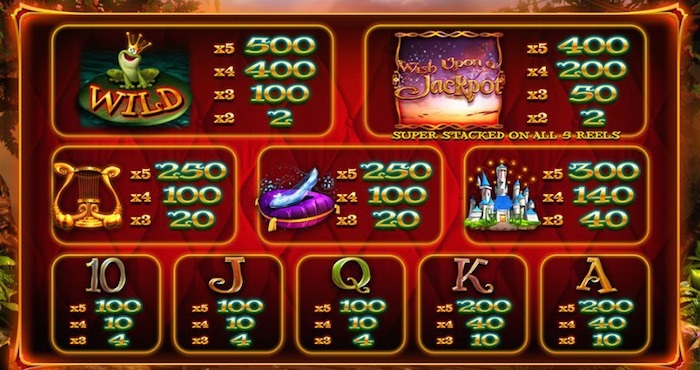 The Wish Upon a Jackpot slot is a five reel slot with 20 possible paylines. The action is set in an enchanted forest, with the star of the show a somewhat buxom Fairy Godmother. The Fairy Godmother appears randomly during play and, if you’re lucky, she’ll wave her wand and some magical purple orbs will appear (sadly, sometimes she appears, you get excited, then she disappears in a puff of smoke). On those lucky occasions, you get to pick an orb and it will reveal one of five super bonus spin rounds. But that’s not all. The appearance of three fairy tale book symbols will also award a fairy tale bonus round. You get to pick a book and it will offer up one of four bonus rounds to get your teeth into. All of these bonus rounds really help to keep the game play going. There’s plenty of variety and interest, and that’s one of the key factors that helps produce a winning slot. Blueprint Gaming have produced some excellent graphics for this attractive and appealing online gaming slot. The background features an attractive forest at twilight, with lamps hanging from trees. The colours of the rest of the graphics reflect this twilight theme, as they seem almost bathed in a golden glow. The graphics are all clear and distinct and the playability is excellent. It’s easy to place your chosen bet and get started, and information about the game is available at the click of a button. The excellent bonus rounds keep the action and interest flowing very well. 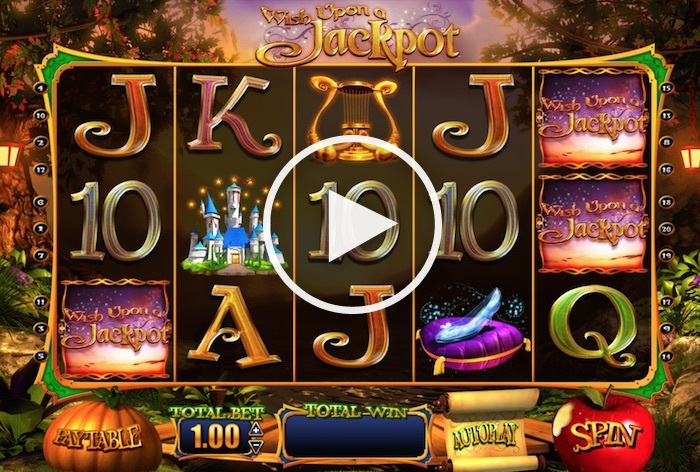 Wish Upon a Jackpot features a range of symbols, including a mix of the usual A, K, Q, J and 10 symbols, plus some perfectly apt symbols that are designed to fit with the theme of the slot game. For example, there’s a fairytale castle, a glass slipper and a golden harp. The wild symbol is a frog in a crown on a lily pad and there’s a picture Wish Upon a Jackpot (WUAJ) symbol too. As you can tell, all the symbols relate in some way or another to popular fairy tales. On another level, these tie in with some of the themes of the bonus rounds. The Paytable is easily accessed at any point from the bottom left hand corner and gives a full run down of what combinations of each of the symbols is worth. As a bit of a taster though, the basic letter and number 10 symbols give each of the lowest payouts. Things get more interesting on the money front when you start hitting three or more harps, glass slippers or fairytale castles. Both the wild symbol and the WUAJ symbols give tiny amounts of cash for two symbols appearing, but a lot more for three, four or five on winning lines. Now, onto the good bit! In terms of value packed UK slot games, the Wish Upon a Jackpot online slot is packed with fabulous extra features. Three Little Pigs free spins – after each free spin, three little pigs appear and turn random symbols into wilds. The wilds remain until the big bad wolf blows them away. Rapunzel free spins – spin the reels and climb the tower to reach Rapunzel. The bonus ends when you reach the top of the tower and rescue Rapunzel. Jack and the Beanstalk – a two-part cash trail that sees you making your way up the beanstalk, revealing multiplier bonuses along the way. Landing on an Advance keeps you going, whilst Collect means you collect you prize and it finishes. If you get all the way to the Golden Goose, your prize will be big – up to 1000 times your stake. Rumpelstiltskin’s Deal Maker bonus – Rumpeltiltskin will offer you a contract featuring either a bonus cash prize or a mystery bonus. You can choose to accept or reject his offers. Pinocchio Wilds, Wild Reels (with a gingerbread man), Puss in Wilds, a Fairy Win Spin or a bonus (which is one of the Fairytale Book bonuses). As you can see, if you love variety, and thrive on different bonus rounds, then this is one of the best slots for UK players as it’s packed with no-end of features. When it comes to betting, you can start off at the lowest rate of 20p per bet. The options increase by 20p each until £1, then they move to £2, £4, £5, £10, £20, £50, £100 and a massive £200 per bet. So there’s a considerable choice and something that should suit every player. The average return to player (RTP) rate for Wish Upon a Jackpot is 92.46% to 95.28%. Blueprint Gaming have put a lot of thought and work into the features that will help the Wish Upon a Jackpot slot stand apart from others and they’ve been successful in what they’ve achieved. It’s a memorable slot with lots of bonus and special spin opportunities and will keep you spinning and coming back for more.